You keep your hair trimmed and looking sharp, why wouldn’t you do the same for your nails? Each year, more and more men find that like a trip to the barber, a visit to a manicurist can be an excellent addition to your self-care routine. However, many men don’t have the time, funds or desire to schedule an appointment and show up at a nail salon for a manicure. Thankfully, you don’t have to leave your home or even put on pants to get a high-grade manicure. With the help of a men’s manicure set, you can give your own nails a little professional-quality pampering in your own home. Additionally, these sets, along with other manly luxury items like a robe for men or one of these best trimmers for beard grooming, are excellent gifts for the dudes in your life. The tools included in a manicure set date as far back as ancient Egyptian times. However, until recent years they have been regarded primarily (and wrongly) as an exclusively feminine item. Sets themselves can include a wide variety of tools and equipment, but they all generally serve a function for your hands or nails. Because these tools are so small, it makes sense to compile them into a contained kit for convenience and organization. The benefits of a good manicure extend far beyond just having nails that look nice. Taking good care of your fingers and what’s on them can also help make you more likeable and improve your overall health. Sure, these are big claims for a little kit, but manicure sets deliver. Having clean, manicured nails isn’t just one aspect of having an attractive presentation, it’s also hygienic. Poorly shaped fingernails can lead to ingrown nails or infection. During a manicure, you trim your nail, remove dead skin, and clean around the fingernail. In doing these, you don’t just improve the appearance of your hands, you also stop the spread of bacteria and help to prevent infection or ingrown nails. You can judge a lot about a person from their hands. Just as those who haven’t yet discovered the best toothpaste for bad breath can make a poor first impression, those with dirty, unkempt hands might be regarded as frumpy and careless. However, those with well-manicured, clean hands free of jagged nails or sharp edges might be considered refined or professional. Think about it, the first thing you notice about a person in a business setting after their smile is probably their hands. Why? It’s customary to shake hands when you meet someone in a formal, casual, or business setting. Young men are taught how to make a great first impression with their hands by having a firm, assertive handshake, but they’re left uneducated about why having a well-manicured hand is just as important. A little-known fact is that poorly manicured nails can actually seriously damage your performance in sports. Besides the fact that badly trimmed nails and toenails can lead to painful, debilitating ingrown nails, they can also affect the way you throw a ball or run. By keeping your toes and fingers both in ship shape, you lessen your chances of having decreased performance levels due to jagged or unhealthy nails. Whether you’re performing your manicure yourself or receiving it as a service from another individual, the process and steps to care for your nails are relaxing. In executing the steps of a manicure using the contents of a manicure set, you also massage your fingers, which promotes circulation and helps you wind down. You’ve probably seen your wife or mother’s manicure set; they’re usually perched on a nightstand or tucked away in a vanity drawer. However, chances are that you haven’t really properly used all of its parts. 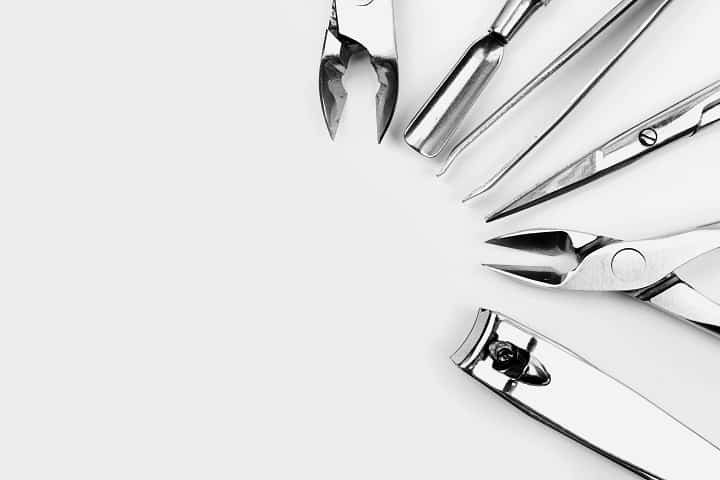 Upon first glance, a lot of the contents of a manicure set might look like tiny torture devices, but don’t worry, we’ll help you sort it all out. Here are the main tools normally included in a men’s manicure set, and how to use each. The standard kit always includes nail clippers, a nail file, and a cuticle trimmer. Other tools, such as tweezers, cleaner, blackhead remover, and callus removers are optional. Any good kit will include the standards, a case, and some variation optional tools. In any manicure set, the nail clippers are the centerpiece tool. As the most commonly used (and most important item), it makes sense to buy a kit with a really good pair. In shopping around, you might notice that the highest-tier products are made in Germany, and are usually constructed out of nickel plated or stainless steel. Among those two, you should always favor stainless steel, as it’s a bit more durable and easier to maintain. With clippers, the metal material is of utmost importance. Because the blades of clippers are really too small to be sharpened, you’ll want to buy a high-quality pair that holds their sharpness year after year. The best designs will have a curved blade rather than a flat one, which helps make trims more natural and snag-free. They should be able to clip off excess nail effortlessly and with little force. If you have to press too hard or wrestle with the clippers, the blade is dull and cheap. Unfortunately, dull blades lead to damaged nails, ripped skin, and the potential for infection. 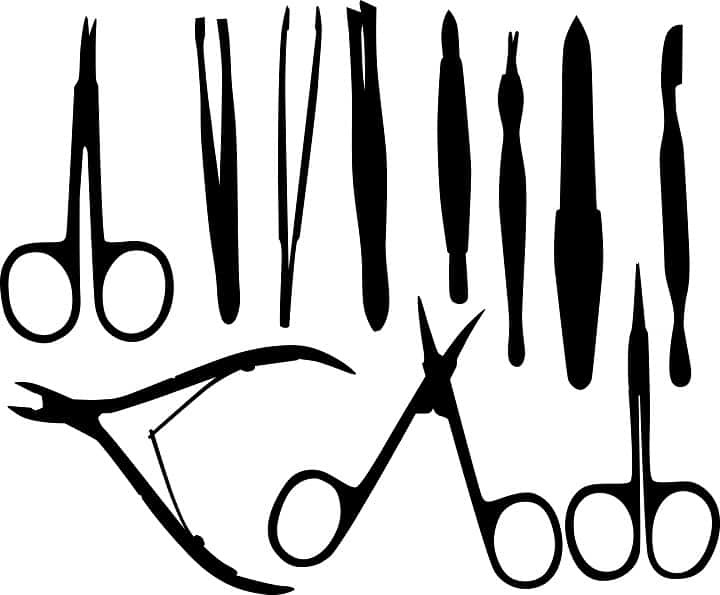 Sometimes shaped like a prong, cuticle scissors are designed to cut cuticles as an angle. Especially in harsh cold or dry climates, it’s not uncommon for cuticles to split and fray. While not necessarily a threat to your health, they are quite unsightly and definitely not ideal. With the help of cuticle scissors, you can carefully remove the hanging and loose bits of your cuticles, and prepare them to be pushed back. Often on the other end of the cuticle scissors is the cuticle push stick. Basically, a cuticle push stick aims to align your cuticle and push it back towards the bed of the nail. This keeps it healthy and intact, rather than frayed. Besides improving the overall look of the nail, it also reinforces the foundation of your nail and helps it grow stronger. Even after you’ve trimmed your nails down, the edges may still remain slightly uneven and jagged. Unless you’re okay with accidentally scratching yourself after your trim, you’ll probably want to enlist the help of a good nail file. Nail files work to shape the nail and ground down sharp edges. A good nail file is thick enough to be effective but thin enough to maneuver easily. Nail buffers usually reside on the flip side of the nail file. It is the finer and softer of the two sides. The buffer aims to shine and smooth, as one of the last finishing touches of your manicure. It can be run over the edge of the nail or buffed lightly across the top of the nail to add a bit of shimmer. A nail brush is somewhat an alternative to a nail buffer and serves much of the same function. These are usually small, narrow brushes with thin yet firm bristles that aim to gently remove debris. By brushing away bits of a filed nail, it cleans and smooths the nail. It’s also useful in removing small particles of nail or dirt from underneath and around your fingernails, and it feels pretty pleasant while doing. Because toenails are so much thicker and stronger than fingernails, it understandably takes a stronger tool to clip them. 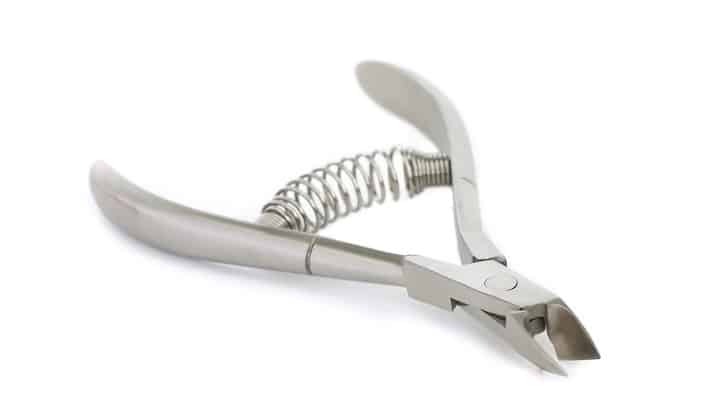 Basically, toenail clippers are protein-guzzling fingernail clippers with gym memberships. They’re bigger, stronger, and heavier. The most noticeable difference between the two is that unlike nail clippers, toenail clippers generally have a straight cut. Because they must be more powerful, they also generally have a longer handle, for increased leverage and ease of use. Great for the removal of splinters or stray hairs, you never really know when you’ll need a pair of tweezers until you do. Especially useful in emergency situations, tweezers have an unimaginably wide range of uses. While they don’t really have much specific use in a manicure set, they’re extremely useful for a multitude of other grooming procedures, and they make a great (optional) addition to any manicure set. The name “nostril scissors” really doesn’t leave any mystery when it comes to guessing the item’s intended use / these little guys are meant for trimming unsightly fuzz out of your nose. 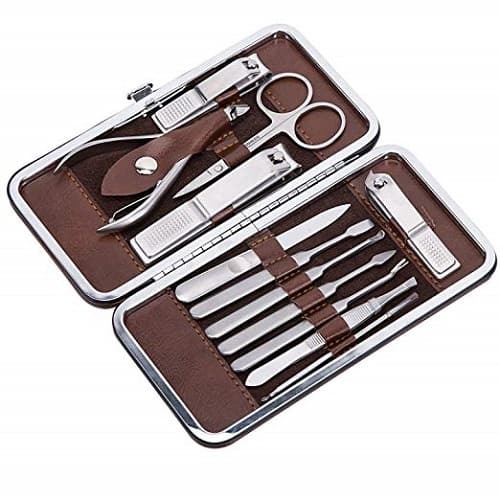 Although technically unrelated to the traditional manicure, some men’s manicure sets and beard grooming kits will also include nostril scissors. Shaped much like small beard scissors, this little tool is generally small with a rounded tip which guards against accidental injuries. While definitely not a necessity, it is a little added bonus. Again, blackhead removers aren’t exactly what comes to mind when you think of a traditional manicure, but they still make excellent, optional additions to manicure sets. These pieces are usually designed as small, circular utensils which remove blemishes by forcing pressure on all sides. Some kits will even include a range of tools meant for extracting facial impurities like face masks for men. Think of the kit case as the toolbox for all your nail equipment. What makes the manicure set a set, afterall, is the case. Designed to keep everything organized and compact, manicure cases usually contain elastic fasteners that keep all tools in place and ready for use. Case materials can range in style and material and are often crafted out of leather or nylon. The truth is that in some cases, manicure sets serve more as “grooming kits” than tools exclusively for use with nails. This is especially true of products which include items like blackhead removers, nostril scissors and tweezers. Besides serving as the tools needed for a home manicure experience, a good kit is also the ultimate travel essential. Equipped with just about every grooming tool you could need, manicure sets are compact and portable for a very good reason. The tools themselves come with no hard rules or procedure. You can use whatever combination of items however you like. For example, while most kits include a cuticle trimmer, if you prefer to skip this manicure step entirely and stick to the trimming and filing, that’s perfectly okay. Your nails, your rules. Because they can include any variation of over a dozen items, it makes sense that manicure sets aren’t one-size-fits-all. In fact, products vary so much in their contents, that just about the only thing they all have in common is the fingernail clipper itself. Outside of that, almost no two products are exactly identical. That being said, here’s what to consider when choosing a set. As most of the contents of any manicure set are made of metal, a material is an important aspect when it comes to selecting a set. What metal each piece is made of determines the quality of the set, ease of use, a sharpness of clippers, and overall price. Clippers and scissors made out of higher-grade metals are going to stay sharper and effective longer. Meanwhile, cheaper metals may serve fine, but fade in effectiveness after a month or two. From simplistic, standard quality kits that will get the job done, to extravagant, luxurious ones which look and feel like a million bucks, there’s a lot of variation when it comes to quality in the world of manicure sets for men. If you’re someone who values high-quality materials and you’re looking to buy one manicure set that’s going to last your lifetime, there’s a product on the market for you. Alternatively, if you’re a simplistic, straightforward man seeking a basic kit that will trim your jagged nails and get the job done, there’s a kit out there for you, as well. All you need to ask yourself is where you fall on that spectrum. The dream is to select a kit that has all of the tools you desire and none of the tools you’d never use. With such a huge range of possible equipment, this is no easy task. One kit might have three kinds of nail files you’d never even touch but be missing something you classify as essential. The next might have all the essentials, but also include half a dozen pieces that would go to waste in your possession. When you shop for a kit, aim to find the perfect balance. You might not be able to get exactly everything you want, but you should be capable of finding everything you need. If you thought that tiny tools couldn’t have big price tags, you’re absolutely wrong. Some of the highest-quality nail sets are manufactured specially in Germany out of extremely expensive metals. Kits like these sell for a pretty penny. 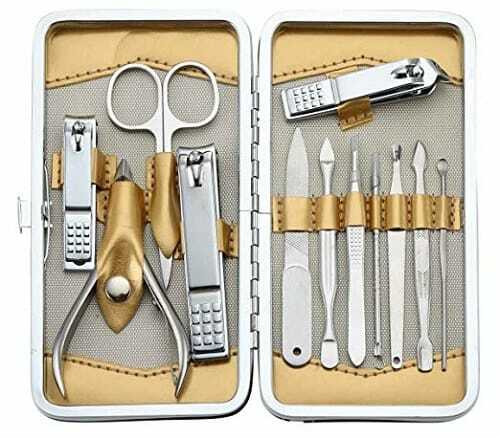 In fact, there are manicure sets on the market today with price tags as outrageous as $600 and over. Thankfully, you can find a quality product for much less than that. 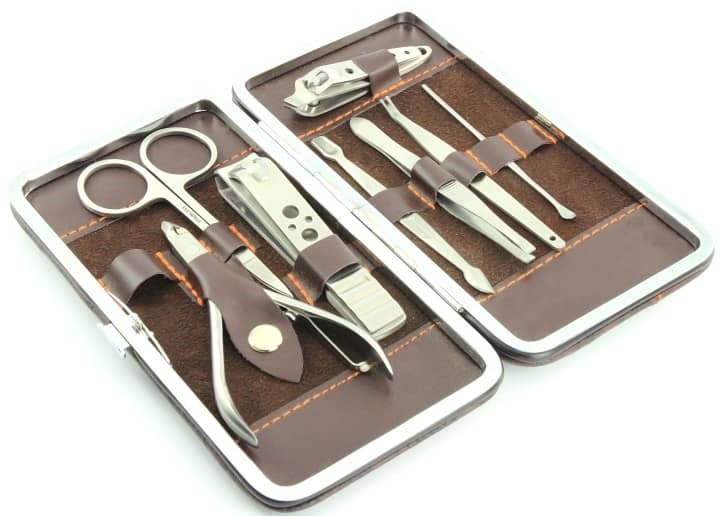 Case type and the number of contents have a direct bearing on how big the whole manicure set is. The avid traveler is probably going to want something neat and compact, while others may prefer to have a large kit with extensive tools. Which suits you depends primarily on your own needs and lifestyle. If you want lightweight manicure and pedicure nail clippers kit that you can pack in your bag and carry wherever you go, Beauty Bon with its 10 pieces is the best you can get. 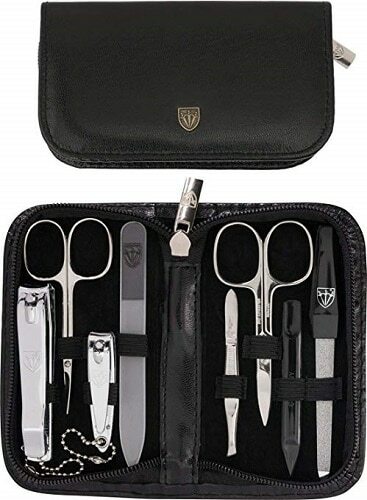 The 10-piece set includes an ear pick, V-shaped push stick, nail file, one tweezer, two nail clippers, cuticle trimmer, beauty scissors, edged push and a toenail clipper. The set is long lasting and all the tools are made of 100% stainless steel. They come in a well-designed, lightweight leather casing that’s extremely easy to open with a simple button push. Besides being affordable, these tools are the best in keeping your nails look beautiful and neat. 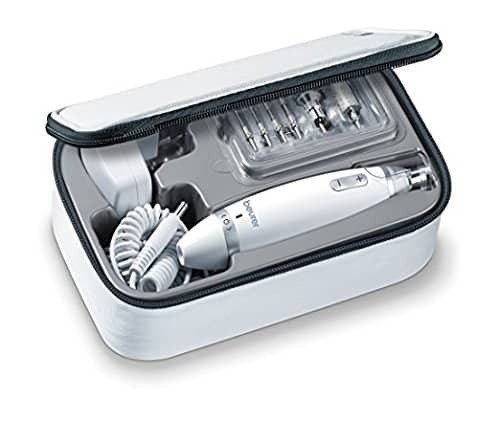 Designed with an excellent quality that lasts, Beurer Kit is simply the best you need to comfortably care for your nails and foot at home. This kit has 10 great quality attachments that are created from long lasting felt and sapphire. The coolest feature is the integrated LED light that helps highlight and brighten the view, enabling you to focus and get perfect results. You can easily carry this product wherever you go because both the attachments and the device can be stored into a high-quality, zippered storage pouch. 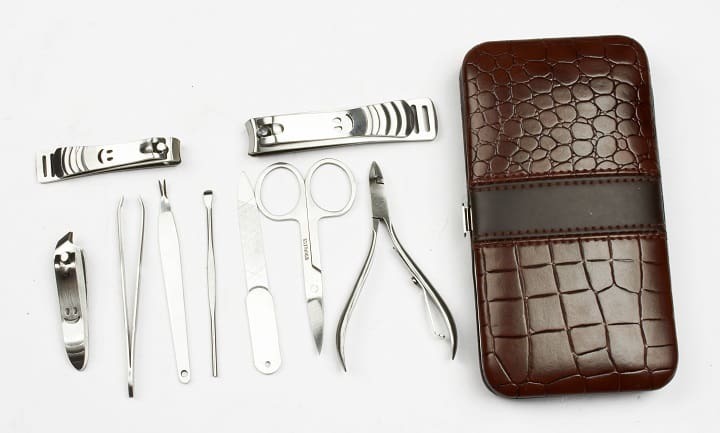 With a durable leather case and heavy-duty trimmers, FAMILIFE Manicure Kit has 11 pieces that include fingernail, toenail, cuticle and ingrown toenail clippers, cuticle trimmer, cuticle and nail polish pusher, tweezers, scissors, nail file, ear pick and V-shaped cuticle trimmer. The leather case is very light and portable and it’s therefore very convenient to carry while traveling. It also doesn’t occupy too much space hence it can easily fit in smaller compartments of your bag. The clippers are very sharp and don’t rust for a very long time, so you can rely on this product to help keep your nails looking good and free from fungal infections for a very long time. Always keep the clippers in a dry environment when you’re not using them. 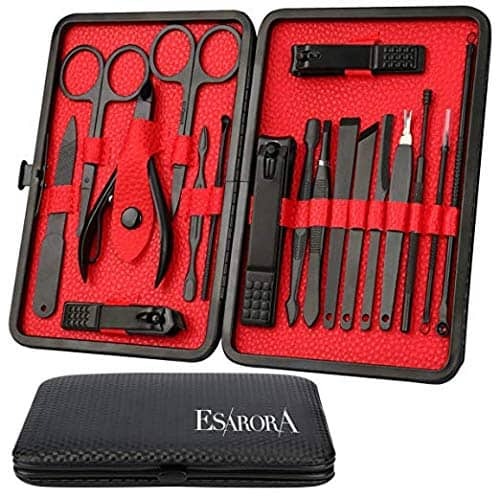 If you need a manicure and pedicure set that has everything you need to satisfy your nail grooming needs, the best option is Esarora that comes with 18 pieces. This kit is designed to fulfill three major functions, which are divided into foot care, hand care and facial care. It has an aesthetic packaging design that features a high-quality fabric and PU leather that looks very classy. All the clipping tools are entirely crafted from stainless steel, which prevents rusting, enhances safe sterilization and reduces infections. For easy carriage, this set is covered with a lightweight and portable, synthetic leather bag that you can simply open with just a simple push of a button. Coming with sharp clipping tools, 3 Swords Germany Kit will give you a great manicure and pedicure experience. It has eight pieces that include sapphire nail file with a fine and coarse coating, cuticle scissors, nail scissors, fingernails clipper, toenail clipper, hoof stick, tweezers and nail pusher or cleaner. The clippers are created with plated nickel which makes them corrosion free. The tools are further polished and harden. What makes this item unique and separates it from other nail care kits is it comes with a microfiber cleaning cloth that you can use to clean the steel items with ease. With sharp and sturdy clippers, Corewill Set of 12 pieces is the best you need to keep your nails clean and good looking. 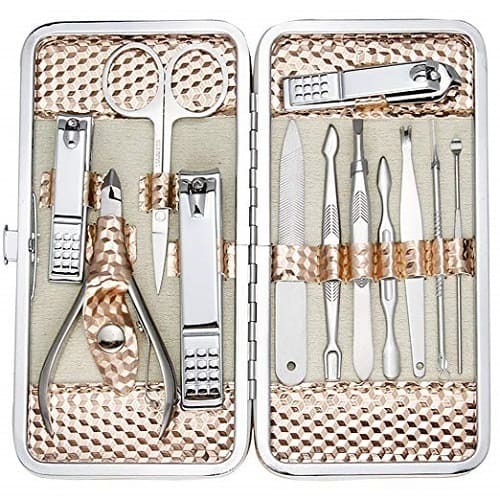 The content of this awesome kit includes nail cleaning tools, three nail clippers, a pair of eyebrow scissors, one eyebrow tweezer, toenail clipper, nail file, blackhead remover, a V-shaped tool and an ear pick. It’s very easy to take this set with you wherever you go because it comes with a nice, synthetic leather case that’s very light to carry and use whether at home or the office. Since it comes in an elegant looking package, this set is great as a gift for someone special in your life. The 12 pieces ZIZZON Professional Nail Care Kit is fully packed to provide you with everything you need to keep your nails nicely groomed. The content includes a V-shaped push stick, toenail clipper, loop remover, blackhead needle, peeling knife, nail file, single-edged, double-sided push stick, eyebrow tweezer, multi-purpose scissors, cuticle trimmer and an ear pick. 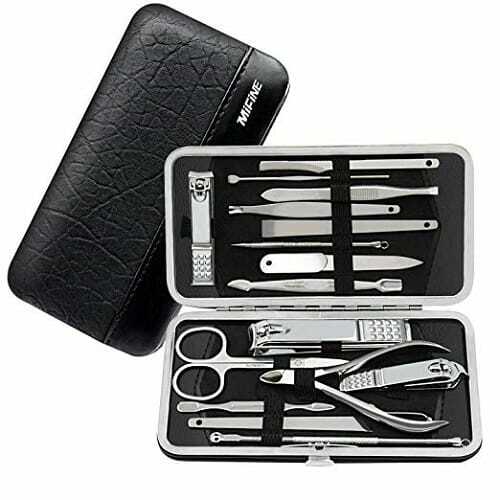 It comes with an elegant and stylish looking case that helps protect the sharp tools. The case is also very easy to close and open with just a simple snap closure. It’s also effortless to travel with, given that it’s lightweight and portable. The case looks luxurious and trendy with a square concave on the rose gold surface. Perfectly made to perform three functions including foot care, hand care and facial care, Keiby Citom Grooming Kit has all you need to get your nails fully groomed. Most users love it because it’s great in quality, reasonable in price and has a variety of tools to choose from. This set is very small and lightweight hence you can easily pack it in your bag and travel with it. The tools are created with high-quality stainless steel that’s non-corrosive, extremely hard and always sharp. It comes with a casing that’s made from a high-quality PU leather that’s elegant and very stylish. Designed with a genuine leather casing and great quality, stainless steel tools, Takumi No Waza will help you get the best nail care experience. Inside the kit, you’ll find a tweezer with extra grip slant, nail file, nostril scissors, stainless steel nail nipper, fingernail and toenail clipper, all of which are essential for your daily nail grooming. The genuine leather casing is zippered and is very important because it helps protect the sharp tools besides looking stylish and fashionable to carry around. The whole package is thoughtfully designed with a size that’s very convenient to pack in your bag and take with you wherever you go. 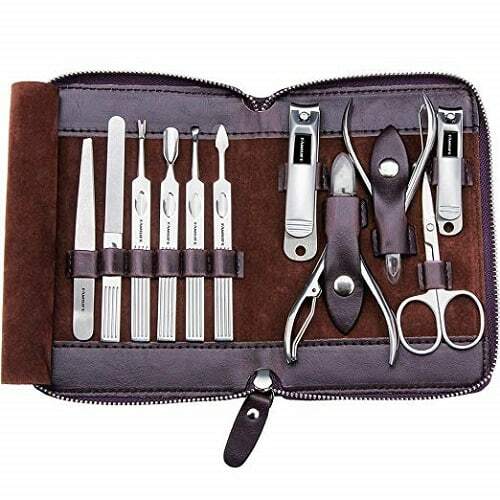 Besides being affordable, JINLI Manicure Set is of great quality and performs what it’s intended for pretty well. You can easily find the perfect tool that’s suitable for your manicure or pedicure needs in it because there are 12 variety of pieces to choose from. 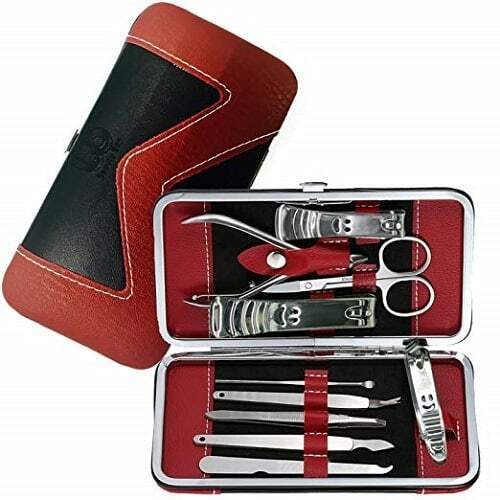 The sharp tools are well protected by the high-quality, synthetic leather case and a metal. The casing is also small in size and can easily be packed in your bag when traveling. It looks like a luxurious, portable wallet which is why it’s ideal for traveling or usage at home and in the office. With 16 different tools for nail clipping, Mifine has everything you need to satisfy all your manicure and pedicure needs. 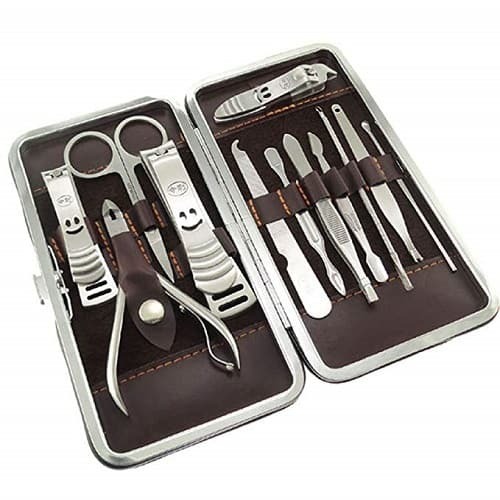 The set is unique and carefully designed with surgical grade steel that enables safe sterilization, prevents rust and reduces the risk of infections. 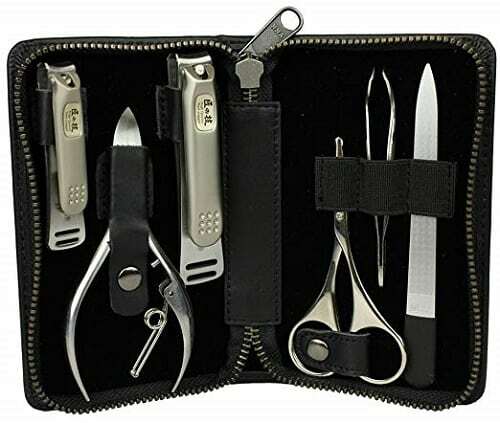 You can easily take and use this set wherever you want because it’s portable and has a synthetic leather case that you case easily open with just a simple push of a button. You will find these tools handy for exfoliations, eyebrow shaping and tackling acne issues. If you don’t have the time, funds or interest in going out and buying a professional manicure, the good news is that with the help of a manicure set, you can easily give yourself one in the comfort of your own home. Here’s a step-by-step on how to give some professional-grade maintenance to your nails. Especially if you’re in a rush or uninterested in sinking precious minutes picking away at your nails, soaking your hands in a warm bowl of water for 5 to 10 minutes is a great way to make trimming easier. It not only softens the nail, but it also reduces the chance of ripping and infection. With the help of a little gentle bar soap for men, you’ll also want to wash your hands before beginning. Alternatively, you can achieve the outcome of soaking your nails before a manicure by simply trimming up after a shower instead. Along with the use of the best shower head and durable shower squeegee, thoroughly cleaning your fingernails should become a part of your daily shower routine, regardless. Start trimming away at the excess nail with multiple, small clips. Curve the cut as necessary – the idea is to round off the nail slightly, but not entirely. This helps prevent ingrown nails. Also, trim the nails with a little bit of excess still remaining, as you want a little wiggle room to work with when you break out the nail file. With the interior of the prongs, slice off and remove any frayed or damaged cuticles. You’ll also want to trim away any bits of hard, dead skin which has collected around the nail. Especially if you have dry skin and conditions like dandruff (which can be remedied with natural anti-dandruff shampoo) or eczema, you might find cuticle scissors an absolute necessity for removing dead skin around nails. Using the end of the tool, press back your cuticle lightly. This doesn’t just help improve the overall appearance of the nail, it also helps to reinforce and strengthen it. selecting the coarser side of the file, brusquely brush the end of your nail to eliminate any snags or rough edges. This helps prevent chipping or scratching. When the nail is mostly smooth, flip over the nail file and repeat the process with the finer side, just for good measure. Your face, body and hair all benefit from moisturization, and your nails are honestly no different. You’re probably already using a good face moisturizer for men or at least a face wash for men which includes hydrating properties, but few think to hydrate their nails. Especially if you want to promote overall nail health and encourage growth, you might consider applying a product at the end of your home manicure. Some of your many options include vaseline or argan oil. By hydrating your nails, you keep them strong and healthy. Nothing is more off putting than ratty, jagged nails. If you want to make a good impression, having well-manicured hands is just as important as having a nice hair cut or wearing presentable clothes. Though manicure sets were previously a feminine product, they’ve evolved to specifically serve men’s needs now, as well. Now, there’s nothing girly about well-manicured nails. It’s the twenty-first century, and men deserve access to clean, healthy nails as well. So treat yourself to a little pampering. Throw on a pair of top boxers and your favorite men’s slippers. Then, turn on your favorite football game and trim away. Photos from: pioneer111 / depositphotos.com, Dr.PAS / depositphotos.com, kzenia / depositphotos.com, kzenia / depositphotos.com, exopixel / depositphotos.com, geargodz / depositphotos.com.